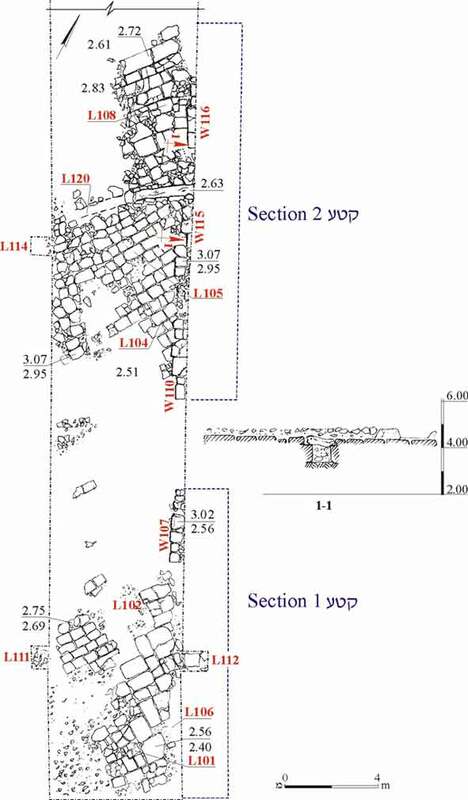 During March–April 2006, an excavation was conducted at Tel Afeq-Antipatris (Permit No. A-4761*; map ref. NIG 193596–672/667626–993; OIG 143596–672/167626–993), during the course of development work in the national park. The excavation, carried out on behalf of the Israel Antiquities Authority and financed by the Nature and National Parks Authority, was directed by D. Golan, with the assistance of E. Bachar (administration), A. Hajian (surveying), T. Sagiv (field photography), R. Vinitsky (metallurgical laboratory), M. Shuiskaya (pottery drawing), G. Bijovsky (numismatics), C. Amit (coin photography), D. Weinberger, A. Re’em and M. Peilstöker (the Central district of the IAA) and T. Tsuk and A. David (Nature and National Parks Authority). Excavations at Tel Afeq were conducted from 1972–1985 (Kochavi M. 1989. Aphek-Antipatris: 5000 Years of History, Tel Aviv; Kochavi M., Beck P. and Yadin E. 2000. Aphek-Antipatris I. Excavations of Areas A and B. The 1972-1976 Seasons, Tel Aviv) and in 1999 (HA-ESI 115:40*–41*). The excavation took place between the theater in the south of the city and the forum in its center (Fig. 1), with the purpose of continuing the exposure of the cardo, which had begun in previous years. Work concentrated only on the cardo’s exposure and abstained from checking on the stratigraphy or chronology. Eleven squares (5.0 × 6.5–7.0 m) were opened across the length and width of the cardo (Fig. 2) and the relative elevation points from the previous excavations had been used, so as to maintain consistent measurements of the cardo levels for its entire length. In three places the excavation was extended beyond the boundaries of the squares in order to locate the lines of the curbstones on the east and west (Loci 111, 112, 114; Fig. 3). Soil fill that contained small stones, potsherds and large quantities of modern refuse from the twentieth century was excavated. Along parts of the cardo’s route, signs of damage and robbery of paving stones were noticeable; those were only preserved in two sections (1, 2), whereas in another section (3) the eastern curb of the cardo had survived. A pavement of large lime flagstones (0.80 × 1.00 m) was exposed in the southern section (Loci 101, 102; see Fig. 3), along the eastern side of the cardo. These flagstones were similar to those exposed in the past along the northern part of the street. Poorly preserved smaller pavers (0.30 × 0.45 m) were uncovered in the center of the road and along its western side; these most likely reflected the maintenance and repairs of the original pavement. 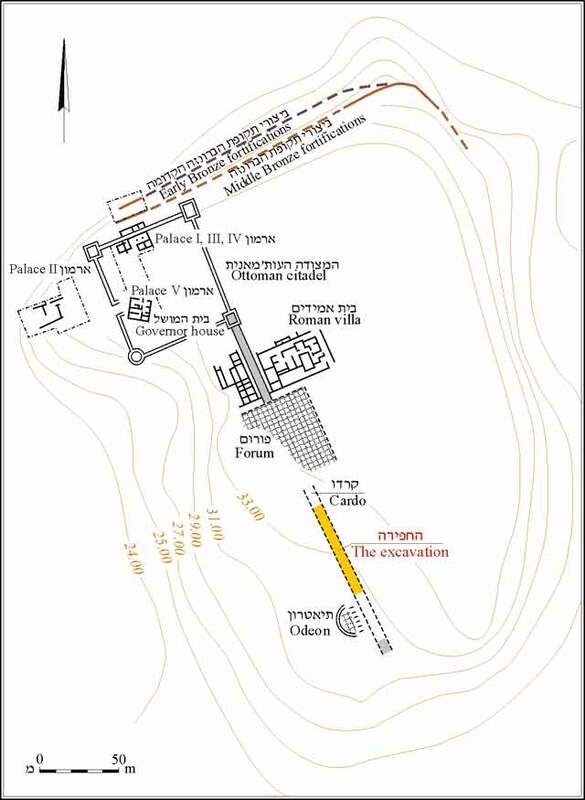 The flagstones were placed diagonally across the street, similar to the other sections, as well as to other streets from the Byzantine period, such as at Bet She’an (ESI 6; 7–8; 7-8:16). The eastern curb of the cardo (W107) was built of two rows of ashlar stones and an ashlar stone (L112; 0.60 × 0.73 m) of the outer curb row was exposed. A layer of tamped earth and small stones (L106) was present where the curb’s interior face did not survive. The bedding of the western curb’s inner face (L111; 0.5 × 1.9 m), which was built of a single course of limestone ashlars, was exposed. 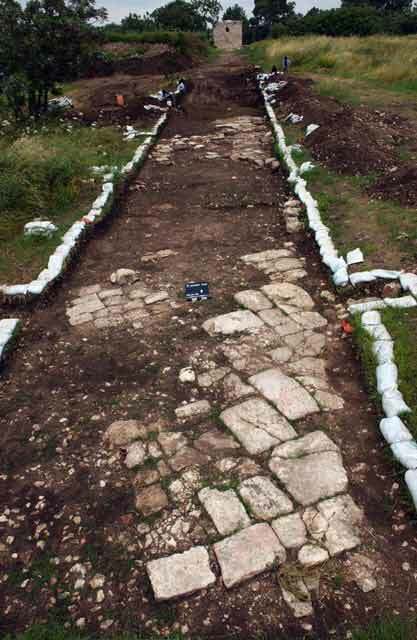 Along the western side of the cardo, no remains of the curbs were found and the cardo’s pavement in this section was preserved for a width of 5.3 m.
The largest section of the pavement was exposed in the middle part of the excavation (Loci 104, 105, 108; Figs. 3, 4). Its stones, smaller and more worn, were also aligned diagonally. The curb (W110, W115, W116) along the eastern side of the street was built of two rows of ashlar stones (0.50 × 10.27 m), a single course high. The inner row of ashlars, partly placed on the outer pavement, was not entirely revealed. The western curb row was not found in this section. The preserved width of the street in this section was 5.3 m and crossing its eastern part widthwise was a drainage channel (L120; 0.37 × 0.40 × 2.86 m; Fig. 3). The walls of the channel were built of upright flagstones that bore the covering flagstones, some of which were broken and collapsed. The bottom of the channel was composed of stones with no remains of plaster. It can assumed that this channel was connected to a main drainage conduit, which ran the length of the cardo, most likely along one of its sides, even though the latter was not revealed. The street’s pavement in the northern part of the excavation (Fig. 4) was not preserved, except for several flagstones (L118); however, a relatively long section of the eastern curb (W121, W122, W125; 0.58 × 1.10 ×14.90 m), built of a single course of ashlar stones, was preserved. The foundation of the wall consisted of small stones and the stones of its outer face were larger and better dressed than those of the inner face. The fragments of pottery vessels recovered from the layer of fill above the pavement of the cardo represented different periods and included a holemouth jar from Early Bronze I (Fig. 5:1), a krater (Fig. 5:2) and a jar (Fig. 5:3) from Middle Bronze II, a cooking pot from the Iron Age (Fig. 5:4) and bowls (Fig. 5:5–8), a cooking krater (Fig. 5:9) and jars (Fig. 5:10, 11) from the Byzantine period. Eight coins were found in the excavation, six were identified and three were illegible. 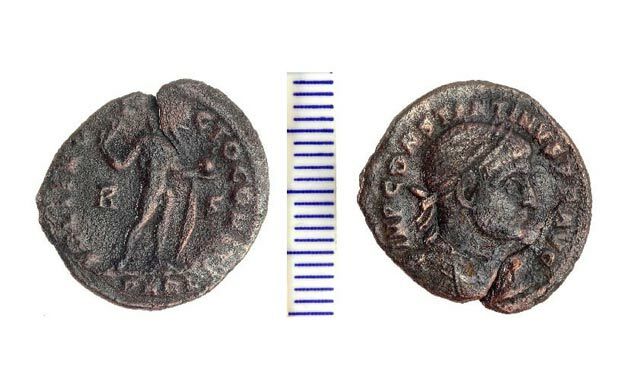 One coin, dated to the reign of Constantine I (317 CE; L101; IAA 100471), was struck in the mint of Arles, France (Fig. 6); another coin was from the first half of the fourth century CE (341–346 CE; IAA 100472); three coins were from the second half of the fourth century CE (IAA 100473, 100474, 100475) and the last identified coin (IAA 100476) was from the fourth and beginning of fifth centuries CE. The excavation exposed the southern part of the cardo whose western side was found destroyed. Unlike Herodian Antipatris, which is located in the northern and middle part of the site, the southern part was dated to the Late Roman period (Kochavi 1989:103). The early part of the cardo in the north and the later part in the south mainly differed in the construction of the street. While the northern part had an arched cross-section that allowed the run-off to drain to the sides of the street, the southern part was flat and had a drainage conduit across it. The cardo at Afeq did not have a stoa and was not opulent. The excavation contributed to our understanding of the development of southern part the city during the Late Roman period. The fact that most of the coins dated to the second half of the fourth century CE suggests that the cardo may have been abandoned at the beginning of the Byzantine period, which seems to corroborate the excavators’ conclusions (Kochavi 1989) that assumed the city was destroyed in the year 363 CE. 2. General view of the cardo, looking north. 3. 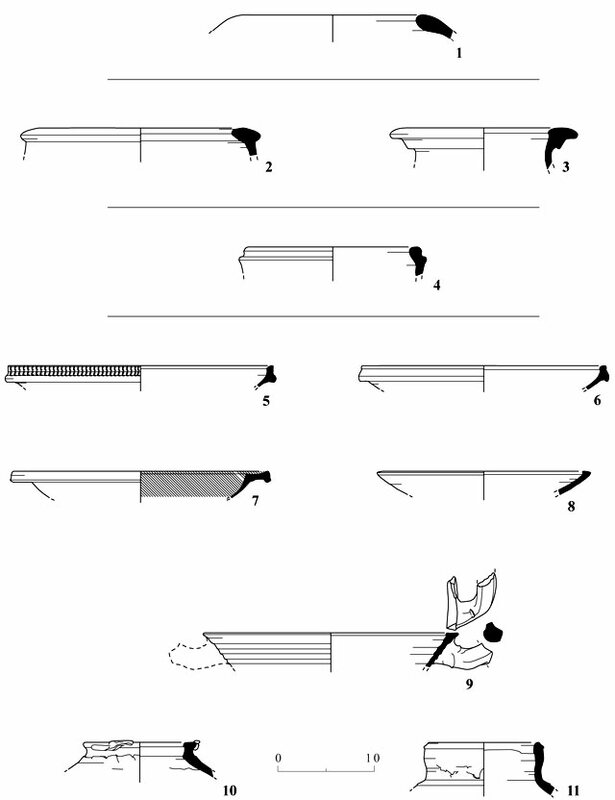 Section 1 and most of Section 2 of the cardo, plan. 4. The northern part of Section 2 and Section 3 of the cardo, plan. 6. Coin of Constantine I.